4 easy to follow recipes that anyone can use for delicious food on a home dinner date. Gentlemen, the time may soon arrive where after a few weeks dating you may invite a potential partner over for dinner. Offline Christian dating experts Friends1st is on hand to help you lay on a delicious meal – regardless of your culinary talents. Here are our 4 recipes for easy home cooking. The nights are drawing in and the journey to your house may be cold and wet. Kick off dinner on the right foot with a comforting bowl of this chicken noodle soup from Delish. Hearty, filling and simple – Italian food is a versatile food style that doesn’t require. 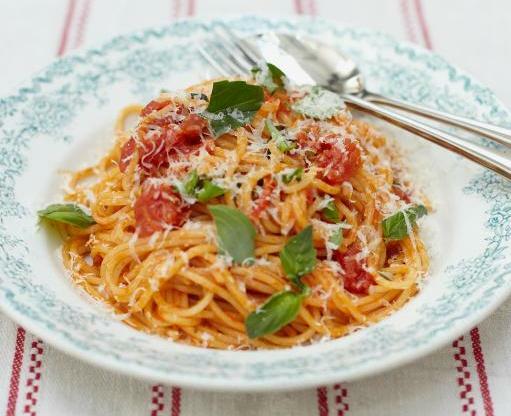 This classic tomato spaghetti from Jamie Oliver packs in the flavour while keeping it simple in the kitchen. It’s aways good to have a vegetarian/vegan option up your sleeve, just in case. This spicy mushroom and broccoli stir fry from the BBC is the perfect easy vegetarian fix. Dinner isn’t the same without a dessert. Try this no fuss chocolate mousse cake from Rachel Allen and the Food Channel to leave a sweet not at the end of your meal. What are your go to meal options for dates? Let us know on Facebook and Twitter. For more dating advice from the UKs No.1 offline Christian Dating agency call 0121 371 0384 or email info@friends1st.co.uk today.